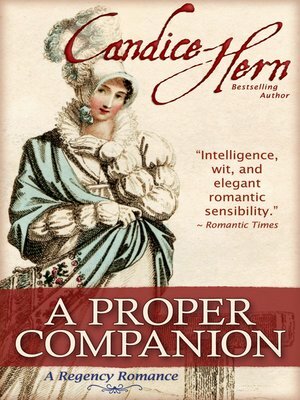 Fans of the traditional Regency Romances of Georgette Heyer, Barbara Metzger, and Carla Kelly will enjoy this witty romance from award-winning author Candice Hern. Robert, Lord Bradleigh, is a rakish earl with a recently arranged betrothal to a lovely young girl he barely knows. Emily Townsend is an impoverished spinster employed as a companion to his grandmother, the formidable dowager countess. Robert agrees to help his grandmother find a husband for the beautiful Emily. But once he comes to know the charms of Emily, he begins to regret his hasty engagement. This sparkling tale will take you from the Pump Room at Bath to the ballrooms of London as the unexpected and undeniable attraction between Robert and Emily blossoms into something more ... something that could put one of them in danger.